In addition to the Teacher Education Program, which will prepare you as a teacher, you’ll specialize in teaching one or more subject areas at a secondary level. Complete Level 2 and 3 coursework and clinical experiences for the Teacher Education Program. Complete coursework in a major and a minor. Pursue any additional minors or endorsements. Click the links below to download major and minor course requirements for each subject area offered through the Secondary Education track. 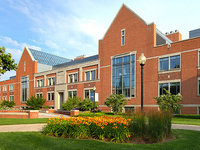 Hope College offers a K–12 endorsement in teaching English as a Second Language to all elementary and secondary track students. Earning this 22 credit-hour endorsement and completing MTTC Test 086 certifies you to teach in an ESL classroom setting, enhancing your marketability. Coursework is in addition to requirements for your major and minor and cannot be declared as a stand-alone minor. Download the ESL course requirement worksheet. All program requirements must be completed for students to be recommended for a teaching certificate in the State of Michigan. Learn more about certification requirements. Curious about an elementary education degree?